One of the challenges of living in a community with lots of new residents or guests is getting everyone oriented to the tasks and projects at hand. When I lived at Foster Village, a 10-person community in Portland, Oregon, we had a membership committee in charge of welcoming new residents, and a liaison assigned to orient short-term guests. A “Welcome Packet” outlined most of the chores and responsibilities a new resident might need to know: how to feed the chickens; where to refill the sawdust for the composting toilet; how to submit receipts for bulk food purchases; and so on. For communities that welcome lots of guests and volunteers, conveying this information can take a lot of time and energy. Guests may offer to contribute to community projects, but may not know how to plug in when they arrive. Residents often have to take time out of their own schedules to orient volunteers and show them how to participate. With Teem, project leaders can create a listing for a particular project, post pictures, and include a to-do list of things that need to be done. 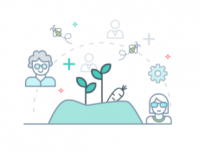 Volunteers can browse through projects and sign up for tasks, allowing them to get a sense of the bigger picture as well as the individual steps involved in a project. 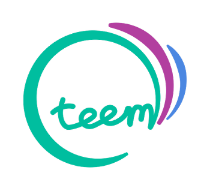 To learn more about Teem, visit its website at teem.works or watch the intro video below. You can download the app for Android or create an account online.